Along with 15 other counties in the state, Nye County Democrats on Saturday awarded delegates to Vermont Senator Bernie Sanders and former Secretary of State Hillary Clinton. Horace Langford Jr / Pahrump Valley Times - Nye County Democratic convention Saturday, separating Sanders and Clinton deligates into groups for the count. 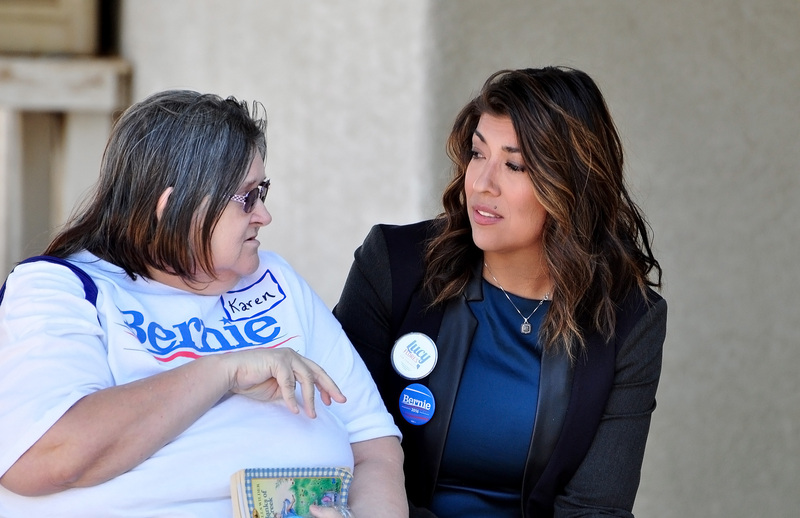 Horace Langford Jr / Pahrump Valley Times - Lucy Flores chats with a Bernie Sanders deligate waiting to go into the Nye County Demacratic convention Saturday. Clinton got 30 delegates from Nye County against 23 delegates for Sanders. They will head to the Nevada Democratic Convention in Las Vegas on May 14. The number was whittled away from the original 95 to 64 delegates for Clinton and Sanders respectively. A total of 143 delegates attended the event, down from 160 delegates that were selected throughout Nye County at the Nevada Democratic Caucus on Feb. 20. The Nye County Democratic Convention was the second step for Nye County Democrats in the process of selecting candidates to the Democratic National Convention in Philadelphia in July. At the caucuses in February, each precinct in the state chose delegates for each county’s Democratic convention. Delegates for the Democratic National Convention in Philadelphia will be selected at the Nevada Democratic Convention. A Nevada congressional hopeful for District 4 and former Assemblywoman Lucy Flores worked the crowd prior to the event. Accompanied by her staff members, Flores shook hands and passed campaign flyers to the people in line. Flores is one of the few Nevada Democrats who endorsed Sanders for president. The state’s democratic establishment largely backed Clinton, giving her a competitive edge in the state’s caucus where she beat Sanders by 6 percentage points, 47 against 53. Flores meanwhile said that half of her supporters are for Sanders and half are for Clinton. “While I will support whoever comes out of the primary, because I think it’s important we come together as Democrats and make sure there’s a Democrat in White House in November, I’m 1,000 percent behind Bernie up until he either wins or drops out,” she said. Nye County delegates stood in a line that curved around the Pahrump Senior Center before the convention kick-off . Many showed support for their candidates by wearing T-shirts, buttons and holding campaign signs. Clinton supporter Ken Washington was at both Barack Obama’s inaugurations. Washington said he wanted to see a woman in the White House. “She is a strong individual, you won’t push her around, but in the same sense, she is not a hothead,” he said about Clinton. Sarah Cole-Burnett and Ryan Lewis, delegates for Sanders, were unanimous in voicing their opinion about high stakes in this year’s election. “He is representing the interests of average Americans and people who don’t have a voice and those are the people that he speaks for,” she said. “Something needs to happen, there’s a lot of issues, a lot of divide in the country,” Lewis added. Inside, Clinton and Sanders delegates mingled together at the tables before the count took place. “If you are with Hillary or Bernie, we are not fighting against each other,” she said. Saturday reports from the Clark County Democratic Convention showed that Sanders pulled a victory in a delegate count thanks to a large number of supporters who turned up at the event that was held at the Cashman Center in Las Vegas. Clark County Democrats posted on Twitter that 2,386 delegates for Clinton showed up at the event, while 2,964 delegates came to support Sanders. The Las Vegas Review-Journal reported that Sanders captured 1,613 delegates that will go to the state convention and Clinton secured 1,298 delegates. The Nevada delegation to the Democratic National Convention will consist of 43 delegates and 3 alternates. While Clark County’s data varied significantly between the initial count at the caucuses in February and the figures from the convention, Nye County’s final delegate count was closer to the caucus figures. “I think that most people are pretty die-hard one direction or another,” said Joanna Lien, first vice chair of the Nye County Democratic Central Committee. Nye County Democratic Central Committee Chair Cliff Arnold was one of the delegates selected to go to the Nevada Democratic Convention in May. “I’m happy with the results, I think it was carried out good, in a good manner,” Arnold said. 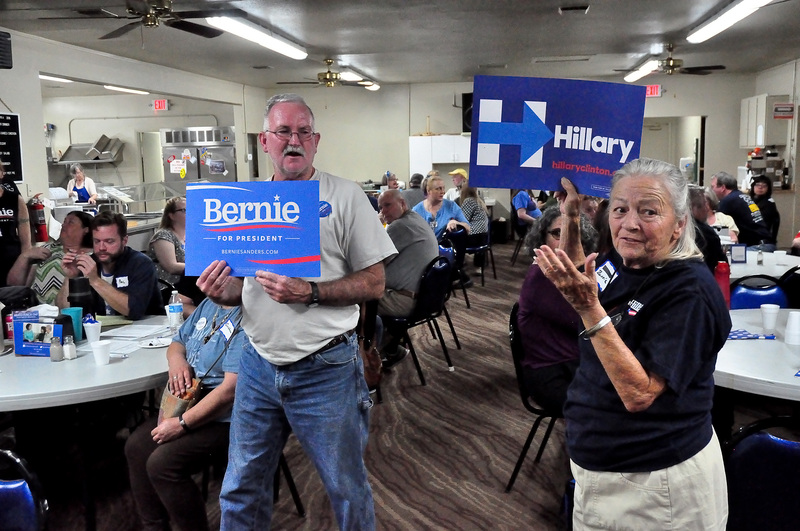 Clinton beat Sanders 59 percent to 41 percent in Nye County at the Democratic Caucus in February. She carried all of the Pahrump precincts, while Sanders won most of the northern precincts.